Second installment on the Stereo Room tracks within the chapter dedicated to recording drums. 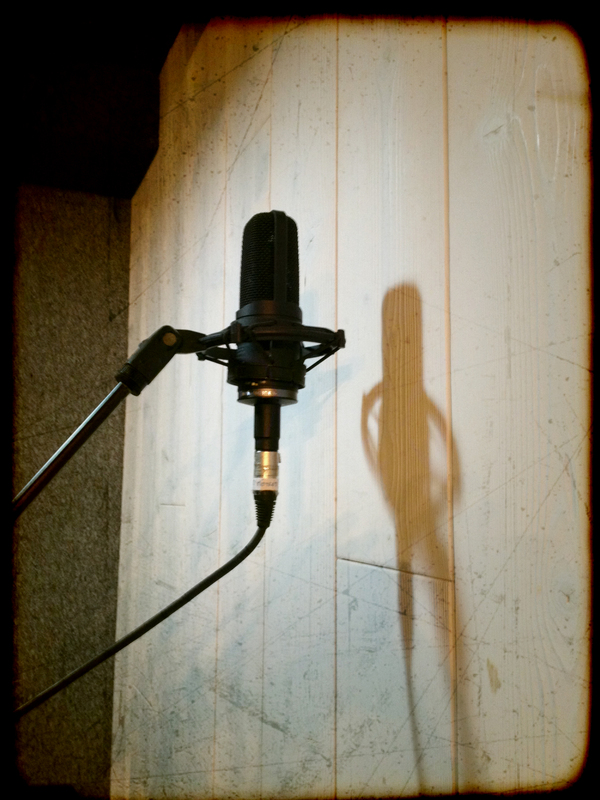 After having looked into the whys, today we'll discuss the hows of recording the Stereo Room mics. 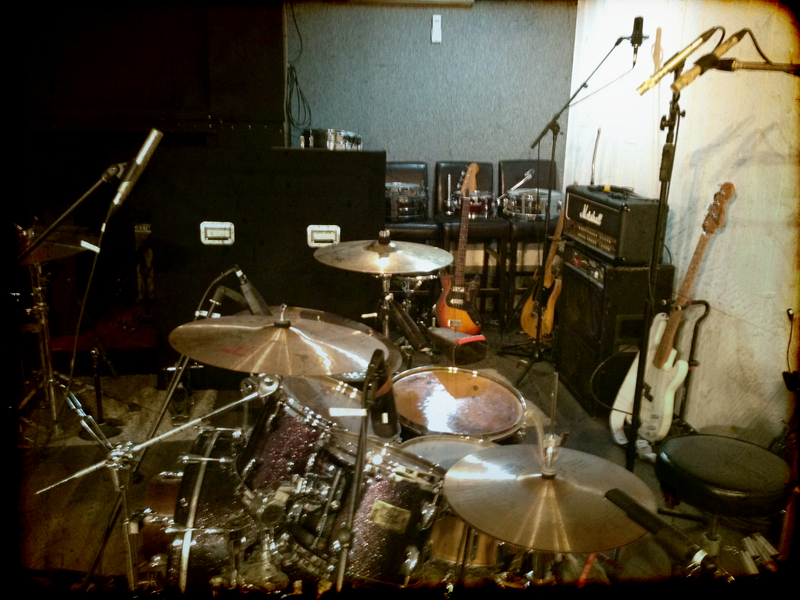 As you have probably figured out by now, the main goal of these recordings is to capture the natural reverberation of the room where you record the drums. 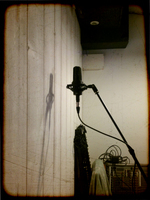 To record the audio clips you heard last time, we did the following, guided by the suggestions of the owner of the studio, who knows the place by heart. The room has the particularity of having a wall entirely covered with wood. Which is something very interesting for our purposes today. A wooden wall can generate a significant reverberation, due to its rigidness, but it's also very smooth in character since the material is much more tender than a concrete wall, for instance. 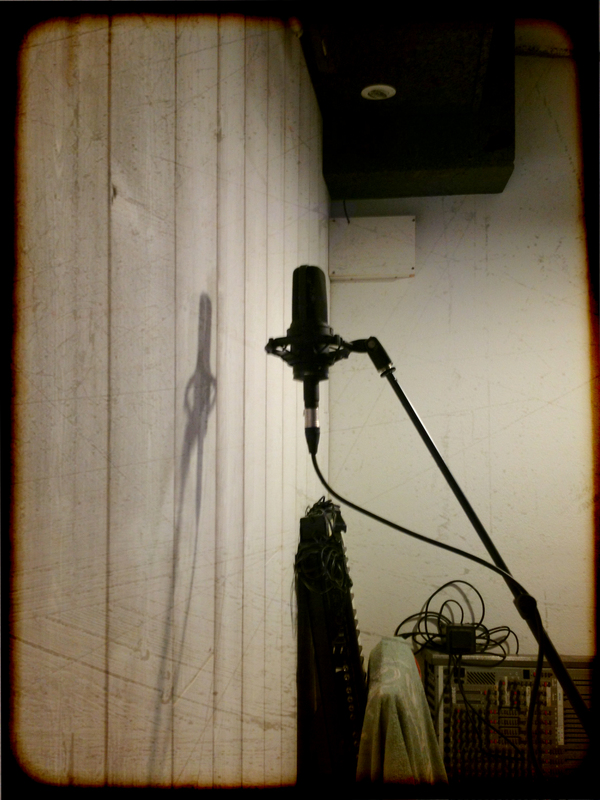 To make the best out of it for our Stereo Room tracks we used a couple of Audio-Technica AT4050 condenser mics placed seven feet away from each other, from the drums, and from the floor. As you can see in the pictures, the mic capsules are directly in front of the wooden wall, about four inches away from it. This way the mics capture basically the reflections from the wall and not the direct sound. Furthermore, we used the AT4050s with cardioid polar pattern to favor the reverberated sound instead of the sound of the drums. Do note, however, that neither the gap between the drums and the mics nor their height was chosen randomly. At such a distance from the instrument we avoid most phase issues, while the height spares us the mumble from the lows and mid lows. There's simply no comparison between the sensation of space, both in terms of breadth and depth, as well as the liveliness and the character of the drums with what we had before! 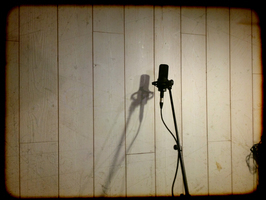 The results of these tracks obviously depend on the acoustic quality of the room where you are recording. 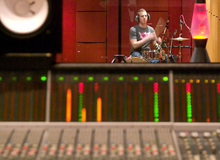 If the drums don't sound good in the room, chances are you won't be able to record a satisfying Stereo Room. But there's always a way to try more or less improve things! A room that's to aggressive in the high end can be mitigated putting some carpets on the floor and heavy cloth on the walls. On the contrary, a very muffled room can be "livened up" adding reflective surfaces in specific places, like plywood panels, for instance. Regarding the mics, there's absolutely no rule. It all depends on what you are looking for. If your goal is to get a natural sound, you'd better go with a couple of relatively neutral dynamic mics, but if you are looking for something a bit more "warm," your best option would be a pair of tube condenser or even ribbon mics. Dynamic mics can also do a good job if what you are looking for is a sound with more "character." I, for one, have gotten excellent results with a couple of SM57s. Their bump in the high mids is particularly fitting for garage rock-like productions. What's more, their weak sensitivity in the high end and their response to transients allow you to compress the Stereo Room significantly during mixdown without the cymbals becoming too shrill. Try different things out! 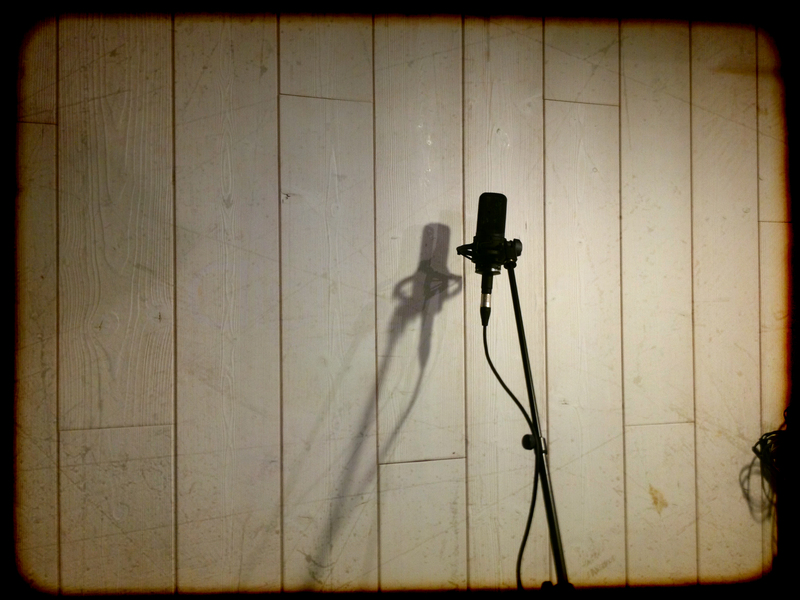 After all, the Stereo Room mics is an area open to artistic freedom. The method I described today is only one approach to the topic, bu there are countless more. We'll actually see some of them in the forthcoming article.